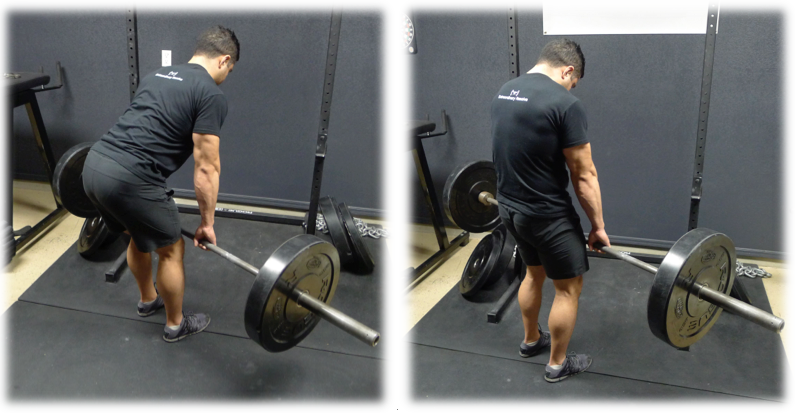 Deadlifting oozes strength and functionality. There’s something to bending over, grabbing a hold of heavy weight, and standing up with it that makes you feel like a primal powerhouse. 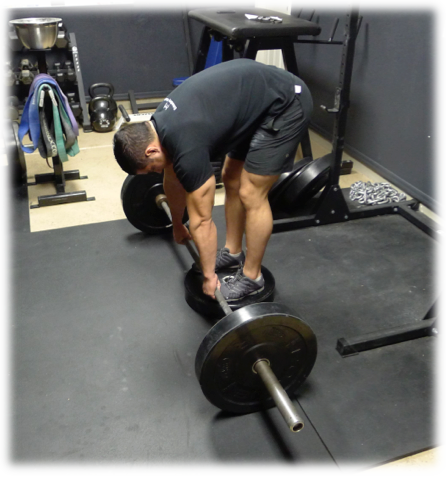 In a previous post, I discussed how to increase your deadlift. But what about various deadlifting variations such as Romanian deadlifts (RDL’s), American deadlifts, stiff legged deadlifts (SLDL’s), and straight leg deadlifts? How are these performed, and what are the key differences between them? 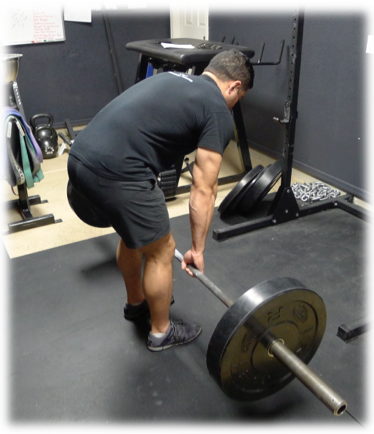 Deadlift variations are loaded hip hinge patterns, and the hip hinge is an essential skill to master in the weight room. Learning how to stabilize the spine and pelvis under load while bending over forms the basis of many popular strength training exercises such as bent over rows, squats, deadlifts, kettlebell swings, good mornings, t-bar rows, and bent over rear delt raises. Even bending over and picking up dumbbells off the floor or out of the lower rack requires a proper hip hinge, as does picking objects off the floor and assuming an athletic position in sports. Learning the hip hinge is also one of, if not the most, difficult movements to teach beginning lifters. Heck, most lifters with years of experience tend to screw this pattern up on a regular basis. This is partially due to the fact that the movement requires strength and coordination throughout the entire posterior chain, as many lifters have trouble ‘feeling’ these muscles in the first place. The glutes, erectors, and hamstrings must work in unison to allow the torso to drop forward while maintaining a neutral spine and pelvis. Since stoop lifting can be achieved via myriad combinations of ankle, knee, hip, and spinal motion, it’s of no surprise that lifters will often choose the most economical bending pattern – one that uses less active muscle and more passive elastic forces via stretching of the muscles, tendons, ligaments, and fascia. This is achieved through rounding of the spine, and while this might be fine during activities of daily living, under heavy load in the weightroom, it’s recipe for disaster. Therefore, you’ll want to learn to keep the load on the active components (the muscles) as much as possible. One way to groove this is by performing deadlift variations using lighter loads, as is the case with the four mentioned in this article. When performed properly, the RDL is an excellent way to build the posterior chain, but unfortunately many lifters limit their leg training to squats, leg press and leg extension variations. While these exercises will certainly develop the quads, they neglect the hamstrings which are key in developing a strong and powerful physique. In this post, I will discuss the proper execution of the RDL and review some common variations of the movement. For the standard RDL, you want to start standing erect, holding the bar with a double-overhand grip. When going heavy, you may use a mixed grip, but I suggest sticking with a double overhand grip during your lighter sets to build up your grip strength. One option for getting into the RDL starting position is to deadlift the weight up from the floor, but ideally you’d have a squat rack with the pins set to just below hip height. This way, you can simply take the bar off the rack and step right back into position. The stance is going to be narrower than a squat, about hip width apart, with the toes pointed straight ahead. 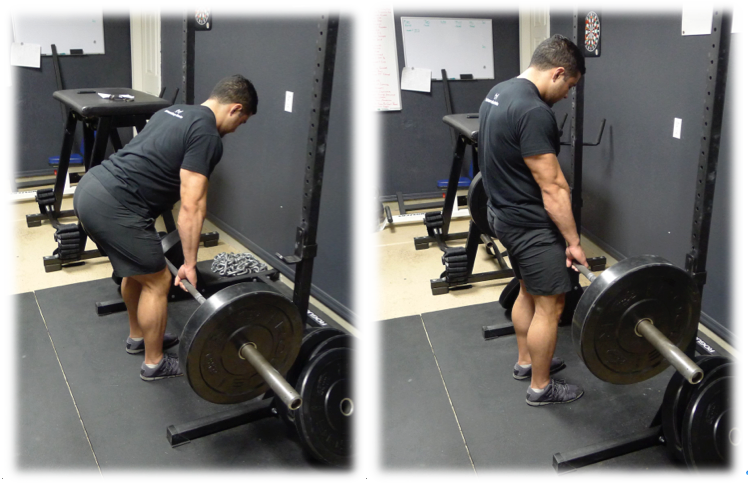 Some lifters like to flare the feet a bit but this should be minimal – no more than 15 degrees of foot flare. At the start, the bar should be resting against the thighs, and for the descent you want to sit the hips back allowing the torso to drop down. The knees will bend slightly but the shins remain vertical throughout – the bar should continue to drag along the thighs the entire time. During the negative, you want to maintain a slight arch and tension in your low back. This tilts the pelvis anteriorly and puts a greater stretch on the hamstrings. However, the lumbar extension and anterior pelvic tilt should be slight and not excessive. Moreover, do not allow the lumbar spine to round or the shoulders to be protracted during the RDL. Keep the chest up and the shoulders back. Most lifters will find that if they perform the movement with proper pelvic positioning, they will feel a big stretch in the hamstrings as the bar reaches the kneecaps. However, individuals with superior hamstring flexibility will be able to descend to mid shin level (some very flexible individuals can descend all the way to the floor this way). Even so, I recommend that lifters reverse the movement once the bar reaches just below the knees, as this is the range of motion with which we are primarily concerned. Here at The Glute Lab, we’ve found that it is possible to perform the RDL with almost no glute activity when focusing primarily on the hamstrings, at least with lighter loads. This is not a good thing. It is therefore critical to understand how to utilize the glutes in a hip hinge pattern. 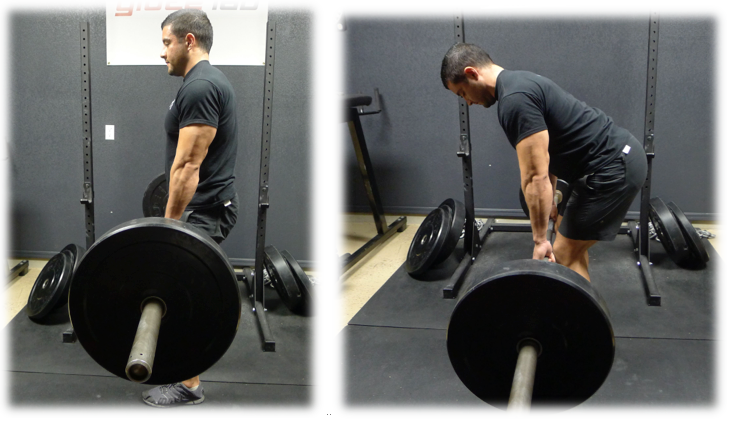 The American deadlift is very similar to the RDL, however you are going to incorporate some pelvic motion. On the way down, you want to utilize the erectors to hold slight anterior pelvic tilt. And on the way up, you want to use the glutes to produce slight posterior pelvic tilt. It is important to note that posterior pelvic tilt is accompanied by a glute squeeze and not by lumbar rounding. At the top of the motion, the bar might move forward as your glutes push the hips forward, you can think of the American deadlift as simply a glute-centric RDL. Again, the glutes tilt the pelvis and the lumbar spine remains stable. Dimel deadlifts were popularized by Louie Simmons and Westside Barbell Club years back. These are akin to American deadlifts for high reps. Use 30-40% of your 1RM deadlift and bust out 15-30 reps for maximum glute pump. If you do these right, it feels a bit like a hip thrust. Many lifters feel that the RDL, stiff legged deadlift, and straight leg deadlift are synonymous with one another, and if you talk to ten different strength coaches, you’ll probably get ten different descriptions of these variations. However, I believe that these are 3 distinct variations and are performed quite differently from one another. Here’s how I distinguish between these variations (again, these are my descriptions, which will differ from other coaches’ exercise descriptions). While I already discussed the RDL (and ADL), I will now discuss the stiff legged deadlift, then the straight leg deadlift. 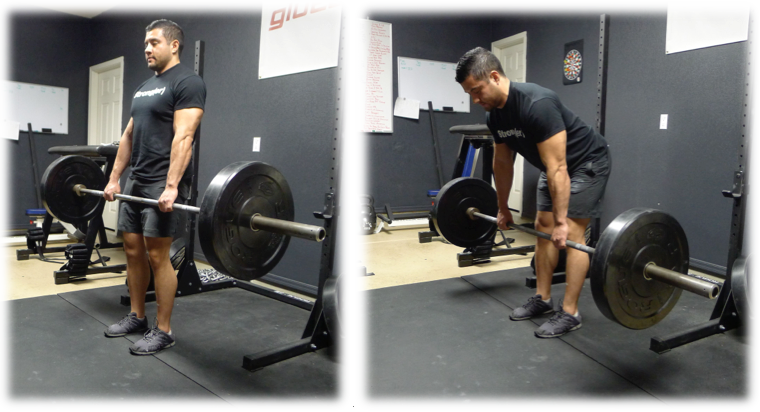 The stiff legged deadlift is simply a deadlift performed with high hips while trying to target the hamstrings. 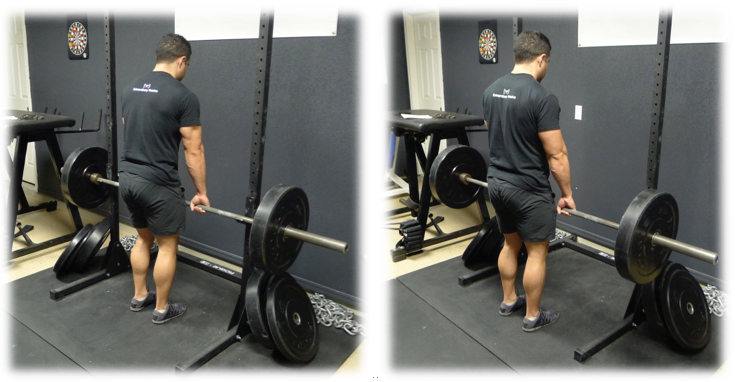 Ideally you will perform this lift out of a rack and you will use a lighter load compared to your regular deadlift. Simply back out of the rack using a double overhand grip and bend over while trying to keep tension on the hamstrings. The knees will bend, the shins will stay vertical, your hips will sit back, and you will try to keep the hamstrings as stiff as possible throughout the movement. With this variation, you can descend all the way to the floor or stop just short of the floor. Both ways have their benefits. You can also start from the floor if you’d like rather than taking the bar out of the rack, however, most lifters use better form when starting with a negative action first. 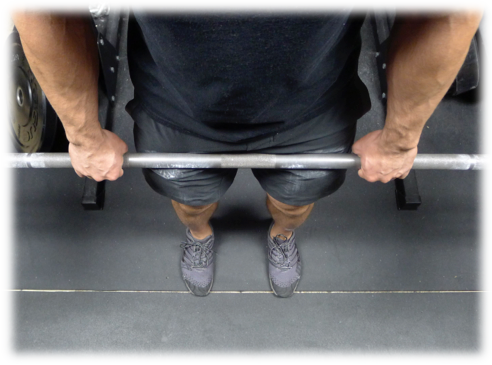 In the straight leg deadlift, you keep the legs straight – there is no knee bend. The spine will be kept in neutral and the bar will drift out in front of the lifter slightly. The range of motion will be very short because the lifter will quickly run out of hamstring flexibility. I’m not a big fan of this variation, however, it does stretch the hamstrings very well and you don’t have to use heavy loading to receive a training effect. Many old school lifters would stand on a bench and perform these while rounding their backs to full flexion and descending all the way until the bar touched their shoes. While this may be fine using submaximal weight of around 20-40% of 1RM, problems will quickly arise when heavy loads are used. Therefore I do not recommend this variation and instead recommend the stiff legged version discussed above. Here is a ten-minute instructional video that discusses the key differences between each variation. What if you’re a beginner and would like to practice hip hinging before you grab a hold of a barbell – what are the best drills to perform? Below are four different exercises you can experiment with. One is from yours truly and the other three are from my colleague Tony Gentilcore. Click on the links for instructional videos. The RDL and it’s variations are great exercises for the hamstrings, glutes, and erectors. Learning how to hinge at the hips properly while maintaining a neutral spine under load is a crucial component to weight training. A strong RDL will enable you to keep better form during bent over rows, kettlebell swings, back extensions and countless other posterior chain exercises. At The Glute Lab, we stick solely to American deadlifts and stiff legged deadlifts simply because we feel that the ADL is superior to the RDL and the stiff legged deadlift is superior to the straight leg deadlift. Experiment to find the variations that work best for you. Remember to utilize lighter loads in relation to your maximal deadlift when performing these exercises as you’re grooving motor patterns in addition to promoting muscular adaptations. Thanks for the video. Very helpful. Could you do a video on the Sumo deadlift as well. It’s really helpful to see you doing the different variations. Thanks so much!! Sandra, I’ll address the sumo deadlift in a future article for sure. Is there a such thing as having an imbalance between the short head and upper hamstrings? I see a lot of programs focus on hip hindging and have no leg curls. I’m just wondering if there important at all. I know you’ve address this in the past but what are your thoughts today? This is a great question. There’s no research on this to my knowledge, but research by Brad Schoenfeld and I will be emerging in the future that looks at differences in upper versus lower hamstring EMG recruitment during SLDL’s and leg curls. And there are differences in activation between the upper and lower fibers, so the answer to your question could be yes in terms of needing both hip extension and knee flexion strength for optimal hamstring development. Hi Bret, Thanks for clearing that up! 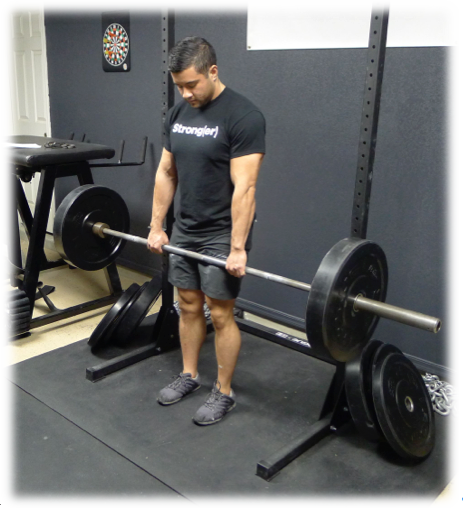 What is the difference between these variations and the traditional deadlift? And which of these variations (including traditional deadlift) can you lift heaviest with? You can go heaviest with the conventional deadlift (or sumo or trap bar), then RDL and SLDL, then ADL. Bret, great article bro. I would love to hear your view(s) regarding utilising DLs in non-split training routines (as I’m your classic Ectomorph and train full body twice per week over 4 working days). Should DLs be used for back thickness instead of rows? Warrick, I like deadlifting heavy once per week and then doing a variation once per week while going lighter without as much effort. They can be used for back thickness, but rows can be performed every workout as they don’t require much recovery. Which one of these deadlift variations is closest to good moornings? Yes, bar placement is different, but hip movement seems similar. The RDL is closest to the good morning. Great article. 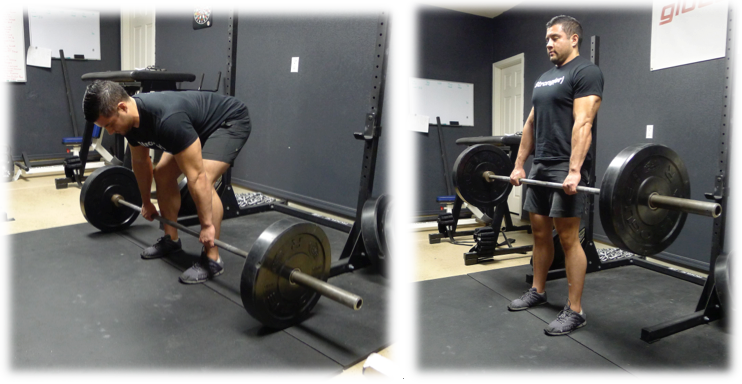 A quick question – is there really much of a difference between the straight legged deadlift and a good morning? I believe a good morning is performed with the bar across your back, however I don’t know the mechanical differences other than that you’re not actually gripping the bar in a hanging position. It terms of joint ROMs and joint torques I’d imagine that they’d be quite similar. I also imagine that you’d see subtle differences in muscle activation, but fairly similar. No, not much different. That was my thought as well. I’ve been using the Straight Legged DL in lieu of the GM to spare a hinky shoulder. That said, you’ve given me a lot to think about here for all of these variations. Bret, I really hate to do this, as I know that I will probably come off as a troller. Just know that since I first stumbled upon your sight, I have back-read every post and followed vigilantly with respect. To see you say “I imagine” makes me sad…the mathematical considerations between the moment arms between a good morning and a straight leg dead lift are pretty significant as well as the centers’ of gravity for each joint involved. I do understand that once you consider the concomitant weight reduction in a good morning vis a vis a straight legged dead lift via the increased moment arm that t=r x f would probably be very similar, however I think the stress on the lumbar segments(during a good morning) and additional stretch reflex on the ham strings(also during a good morning-which you alluded to in the body of your post) warrants a more carefully chosen response other than “I suppose”…2 plus years of reading everything you’ve written and all that I have been able to do is nitpick over the most menial and minor Mathematica quibble. Normally wouldn’t even be a bother, just happen to *feel* that they are actually pretty different…notice the emphasis on “feel”! So could just be my emotions getting in the way…future EMG research? you shouldve taken a big breath first. and then thought about the moment arms in gm vs deadlifts. draw a picture if u cant “imagine” that. second, there is absolutely no fundemental differences in terms of stretch reflex with gm and rdl – only between gm and a sdl which starts with the concentric movement from a dead position (another, better suited definition imo for sdl which for example rippetoe uses). it all depends on your specific execution. now do you see why bret was right guessing what he guessed? The GM will challenge your spinal erectors from sacrum to cranium to a greater extent. You will never “low bar” the GM enough to keep the load directly over the feet in the bottom hip flexed position. The bar will necessarily end up slightly out in front of the body’s center of mass. This offset load greatly challenges the stiffness of the spine! Meanwhile, the SLDL load stays close to the body’s center of mass, i.e., closer to the shins. This due to lat involvement holding the arms at an angle back towards the body. Even if you try to dangle the arms further from the body (not recommended), in practice and under load, the lats are going to kick in and start pulling the bar back towards the body. Keeping the load directly over the feet enables you to use far more weight, and also train the hamstrings through a greater ROM. The SLDL is also a better variation for training the stretch-shortening cycle (think quick eccentric/concentric transition). And finally, while you can get away with some thoracic rounding on an SLDL, to do so on a GM will cause you to dump the bar overhead, or round the lumbar, neither of which is a great result! Both are first rate posterior chain exercises with slightly different applications. The same, but different. Looking at this pic, the bar does move out in front. But I’m curious to see if this occurs with near maximal loads. With maximal loads, (not sure that’s a great idea on GM’s unless you are in a rack, or have the Westside sling), I predict the first casualty is ROM. This variable obviously must be controlled for the study, yes? It really says this, it was verified in an obscure study back in the 70’s! With the SLDL, the body will trade out the T-spine to preserve the L-spine. I love both moves, and to me they have different applications. Thanks Derrick. Very helpful way of looking at this. Thank you sooooooo very much!!! I’ve always been confused about the different types of deadlifts. This was great. I loved the fact that you provided a snapshot/review of each one at the end. Once again, thank you :)! what is best way to improve grip strength? it seems to be my most significant limiting factor (I typically use chalk). Also, is it normal for my lower back to extremely tight (almost painful) for 5-10 minutes after deadlifting? It goes away after 10 minutes. Great work. The hinge pattern is difficult to teach, but pure posterior magic when it clicks. Thanks for sharing the progression hip-hinging drills. Very detailed explanation, indeed. I even think it’s more than just a lecture in a bodybuilding for beginners course. But just to add something about Good Morning and Romanian Deadlift, I see that both are pretty the same and their difference is hardly noticeable. I think however that GM hits the lower back a bit harder than RDL does. So, if one is concerned with hamstring development he should prefer RDL. Mark Rippetoe taught me to use the lats to keep the bar in contact with the body at all times. Great instructional video Bret/Glute Gang. Always great information. Thank you. Great instructional video, thanks Bret. What are your thoughts on the Jefferson Deadlift? Is it possible that the body goes about “finding the most ergonomically, least labor intensive line” by engaging the lats to keep the bar close to the center of gravity? Brett , your the man when it comes to talking about the backside. Thanks for clearing up the differences. I always thought that in SLRDL the bar is at some distance from the shins as against the RDL and that you don’t hinge at the hips in SLRDL. Just my impression. Otherwise what’s the difference between SLRDL and RDL. Thanks for explaining the differences between these lifts–especially with the importance of learning proper hip hinge technique. I’ve seen so many people with bad posture who don’t keep a neutral back. It’s not long before they stretch the ligaments in the SI joint too much and too repeatedly and then end up with back problems. I’ve noticed a slight stubbornness in some people when trying to teach them the proper way to bend at the hips. Have you noticed the same thing? A lot of times they tell me that their yoga instructor said it was okay. to round the back. Great Explaination about the differences between the variations of deadlifts. However there is another variation, of which i would love to have the pros and cons evaluated by you if it is not too much to ask. It is called the “barbell-braced-stiff-legged-deadlift” and according to the authors (criticalbench.com) it is supposed to be great to target the hamstrings. Do you think this is a recommendable exercise in order to develop strength in the hamstrings? It seems to be helpful especially for beginners because you do not have to deal too much with balancing the bar. does anyone here have any tips for people with hyper mobility who are trying to dodeadlifts? its very hard for me to micro unlock my knees. its easier for me to keep them locked (which is terrible) or they bend a lot. its hard to just let them bend a little bit. any tips? What are your thoughts on stiff legged deadlifts for those with poor ankle mobility. Also with stiff legged deadlifts, would you lock your knees out to a point of contracting your quads? I’d like to deadlift or squat to strengthen by quads but I have sever knee osteoarthritis & must keep pressure off my knees. Any suggestions? I have a question I’ve never been able to find an answer to, hopefully as the master of the hips you’ll have that haha. When I deadlift traditionally, i sometimes get a very slight curve in my lower lower back. I don’t mean the usual curve people get, it almost looks like my QL is sticking out when I deadlift. It happens when I deadlift anything more than 50% 1RM. I do feel a lot of aching in the QL afterwards as well, which makes me believe I am using my QL more than the erectors when lifting. I’m not sure if this is caused by an imbalance somewhere, but it doesn’t cause me “pain” as such and I do feel like I’m deadlifting ‘properly’. The ADL looks interesting, I will give it a go when I get home! Quick question about the posterior tilt during the American Deadlift. What is the overall goal in performing the tilt when there is no resistance being applied to that movement? The weight from the barbell in addition to the body position at the top portion of that movement means there is little resistive force counteracting the poster tilt from the glut squeeze. If I am incorrect in this assumption, do you know of any EMG research showing the level of glut activation during the top portion of that movement at vary loads? Unless it is more a technique-based movement to help people better understand how to activate their glutes. Am I right in thinking that in a single-leg deadlift you won’t be able to sit back quite as much as in a bilateral? https://www.youtube.com/watch?v=PboE7gQjklo Max Shank seems to have quite a vertical thigh here. I’ve found it hard to sit back very far without falling backwards in the single leg.